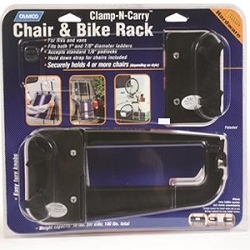 Chair rack fits both 1” and 7/8” diameter ladders (adapters included). 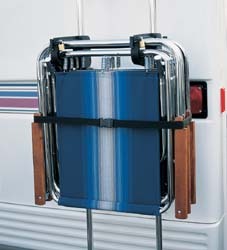 Securely holds four or more chairs, up to 50 lbs. per side. Swings outward for easy access; inward for travel and storage. Will not rust or corrode. Can be locked with 1/8” padlock. Black. (Does not fit square tube ladders).